The Indian forces arrived in Srinagar and the first Indo-Pakistani war over Kashmir territory was fought, leaving the people of Kashmir with an active militarized Line of Control that divides the families. The Instrument of Accession signed by Hari Singh maintains that the entire state belongs to India, including the part now held by Pakistan. It gives India authority to control the state’s defence, foreign policy and communications. Yet the unpopularity of the King and the conditions in which the transfer happened raise questions about the validity of such an accession. To end the fighting, India brought the Kashmir issue to the United Nations hoping that it could get Pak administered Kashmir back since the King had now signed the accession. But the whole attempt backfired, as it was established in the United Nations that the unpopularity of the ruler demands that there must be a referendum to confirm that people have willfully acceded to India. The United Nations resolution of 1948 demanded Pakistan to remove the tribesmen that entered Kashmir to ‘liberate’ it. Once that had been done to the satisfaction of the commission, India was to withdraw its forces from the region in order to make way for a free and fair referendum. However, neither country fulfilled these conditions and instead through diplomatic efforts began to frame Kashmir as a bilateral issue. Through bilateral efforts, India and Pakistan progressively dismissed all recommendations of the United Nations and continued to fight each other over territory. The intermittent bilateral treaties such as the Tashkent declaration of 1966, the Shimla agreement of 1972 and the Lahore declaration of 1999 continued to digress from the main issue—Right to self-determination of Kashmiri people— and instead focused on ‘peace’. The war, of course, was the result of fighting each other for Kashmir territory. The first Prime Minister of India, Jawaharlal Nehru, gave a historic speech in Srinagar, promising a referendum for Kashmir. Within Kashmir there was a politically strong constituency that had little hope in the Indian system and wanted Kashmir to join Pakistan instead. But those who engaged the Indian system in Kashmir – predominantly the National Conference and its leader Sheikh Abdullah – suffered a series of political failures despite his authoritarianism against his opponents. The autonomy granted under the instrument of accession to Kashmir also began to slowly wane, leaving the popular leader of Kashmir disillusioned. He began to make a number of speeches calling for the possibility of Kashmir’s independence. As a result, Abdullah and his associates were arrested, under orders from the Government of India, and a regime led by Bakshi Ghulam Muhammed was put in place. This coup initiated a trend that was to define the Government of India’s relationship with Kashmir: Each time a Kashmir leader attempted to hold on to autonomy, he was forcibly removed, and pro-center politicians would be put in place in order to curtail the secessionist aspirations of the people. After 1953, the political processes within the state have remained fraught with tensions and violence. The watershed moment came in 1984, when Maqbool Bhat, a Kashmiri nationalist leader, was hanged in India’s Tihar jail on accusations of being a Pakistani agent. This event seriously radicalized the Kashmiri politics; several armed groups began to mushroom in Kashmir. By the early 1980’s the failure of secular nationalist politics had forced the new generation to respond to the calls of Islamist politics emanating from neighboring war-torn Afghanistan. The ouster of the Muslim United Front through rigging of the polls in 1987 elections paved a way for the armed uprising. Kashmiris affiliated with both secular and religious groups crossed the Line of Control to get arms training in the camps set up in Pakistan administered Kashmir. However, unlike the popular belief that most people who crossed into Kashmir were foreign mercenaries, the truth is many Pakistan-based Kashmiris who joined the ranks of the armed struggle were actually children of refugee Kashmiris who have moved to Pakistan in prior decades. Many Kashmiris working for the Indian state lived under fear, which ultimately led to the mass migration of the valley’s minority Pandit community from Srinagar to the neighboring district of Jammu. Thousands of Kashmiri Pandits suffer inhumane living conditions in the refugee camps set up in Jammu. The counterinsurgency processes saw a further militarization of the Kashmiri society. According to the home ministry of India, twenty years after Kashmir erupted into an armed insurgency, there is one Indian soldier for every eleven civilians in Kashmir. Most recently the number of army personnel is 700,000 that are fighting 200 active militant Kashmiris. Under such militarization, the Indian army is accused of grave human rights violations by local and international human rights organizations. In the last two decades, tens of thousands of Kashmiris have been killed or subjected to enforced disappearances and sexual violence (estimates vary between sources). The psychological impact has been felt by almost half of Kashmir’s population. Kashmir erupted three times since 2008. In 2010 alone, “over a hundred residents in as many days, mostly teenagers and youth” were killed. The militarization of Kashmiri politics has also led to the breakdown of justice systems. This lack of justice and absence of a political will to deal with Kashmir’s young population makes a number of Kashmiri youth to see militant ideologies as the only option. In the current uprising, the demand for the recognition of the right to self-determination is organizing the Kashmiri resistance yet again. Internationally, the resolution has reached a stalemate, as the Indian and Pakistani claims over the region obfuscate the Kashmiri political consciousness, which is routinely repressed through nationalistic narratives of subcontinental history. 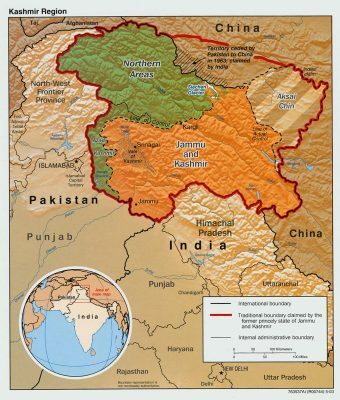 For decades, India has maintained that Kashmir is its internal matter, while Pakistan has kept raising the issue as an international one (though oblivious to the varied political aspirations of Kashmiris living on the Indian side) and is also blamed for denying political rights to Kashmirs in Pakistan administered Kashmir. The international response to the issue has been very inadequate. Most powers have left Kashmiris to the political elite in India and Pakistan, who often use the Kashmir issue to score points domestically. Moreover, the United Nations recently was denied access to the region by India, so there is very little international effort to mitigate the violence in the region. Treating the Kashmir issue as a simple problem between the nuclear powers India and Pakistan will have fatal consequences. Kashmiris on both the Indian and Pakistani side are forming alliances to bring out on-the-ground narratives in order to direct the world’s attention to this simmering war that has impacted them the most. The international community must respond by providing spaces to Kashmiris for self-representation. If their right to self-determination was acknowledged, the conflict could be resolved. Inshah Malik (twitter: @inshahmalik) has a PhD in Political Theory and Gender Studies. She is also a former Fox International Fellow at Yale University. She is currently working on her book “The Insurgent Women” about questions of Muslim women’s agency in Kashmir’s resistance politics. Ali, Rao Farman. Kashmir under the shadow of gun: Making of Alfatah. New Delhi: Uppal Publishing house, 2012. Bazaz, Premnath. Democracy through Intimidation and Terror: the Untold Story of Kashmir Politics. Lalchowk: Gulshan Books Publishing, 1978. Gania, Abdul Jabbar. Kashmir and National Conference Politics (1975-1980). Srinagar: Gulshan books, 1984. Gockhami, Abdul Jabbar. Politics of Plebicite . Srinagar: Gulshan Publishers, 2007. Jong, Kaz de. Conflict in the Indian Kashmir Valley II: psychosocial impact. Research, Medicine Sans Frontiers, 2008. Navlakha, Gautam. “Internal Militarization: Blood on tracks.” Economic and Political Weekly, Vol. 32, issue. 6,, 1997: 299-306. Navlakha, Gautam. “POTA: Freedom to Terrorize.” Economic and political Weekly, Vol. 38, Issue 29, 2003: 38-40. Rai, Mridu. Hindu Rulers, Muslim Subjects; Islam, Rghts and History of Kashmir. Princeton University Press, 2004. Robinson, Cabeiri deBerg. Body of Victim, Body of Warrior; Refugee Families and the making of Kashmiri Jihadists. Oakland: University of California Press, 2013. Snedden, Christopher. The Untold Story of people of the people of Azad Kashmir. London: C. Hurst & Co. (Publishers) Ltd, 2012. Very well put together for those who want to know the real reasons that led to the current problem in Jammu & Kashmir. Many of the points are distorted to suit the narrative of the preconceived mind. The best example of communist and Islamist confluenced thought process. 1. UN is a failed organization, as it failed to solve any problem came to it. 2. 1948 Kashmir resolution of UN displays the meekness of Nehru and crookedness of the world bodies. 3. Even if 1948 resolution was unfavourable to India, Pakistan never respected it. 4. 1948 resolution is now obsolute, has no relevance. 5. The same instrument of accession was signed by the King of Kashmir as was drafted by British for other 400 states. 7. Writer failed to taked into account that the Kashmir which was 100% Hindu land in 1339 how converted into present 100% Muslim land. 9. The total strength of Indian army is 1100000, out of which 700000 is deployed only in Kashmir! Take the total area of Kashmir and divide by that number one can understand the lie behind that number, as the local populace also has to be adjusted within that area. Moreover, if the ratio of army is 11:1 then any mindful person can understand that it would be next to impossible for the people to participate in any agitation. 10. Army killed, army raped, army plundered, army looted, no justice system exists for the most peace loving people- what a joke? Author with malafide intention did not like to recognize that it is army a disciplined force not the gang of decoits. 11. In post Burhan Wani episode para-military forces mostly CRPF and state Police was deployed to control the stone pelting crowed. 12. The number of injured among armed forces and the stone pelters are nearly same, that reflect the restrains sensibility on the part of the forces. The writer is expected to be freevfrom pre judiced view. We are living in 21st century the Kashmiri want to go into 1400 years back in Prophat Muhammed era. The entire problem in Kashmir is the desire of a few to convert it and rest of India into an Islamic state. Every pleaple start talking about human right and blah blah, did they thought about the right of the people say even if it is only 2 if he/she do not like to be part of the rest of the masses in the event of self determination? POLITICS IS NOT MORAL SCIENCE. So many typos crept into, difficult tovl type on mobile. The blog writer seems to be a prejudiced radical Islamic fanatic. He/she must either be intentionally propagating lies or must be brainwashed to believe in utter lies. Islam is a peaceful religion and thankfully there are more moderate Muslims in this world than fanatics like the blog writer. Kashmir belongs to India. Kashmiris will have a good future in India. Sane Kashmiris should see through the truth and do no encourage these Jihadi blog writers to poison the young minds of Kashmir. Look at what these fanatics have done to Palestine, Afghanistan, Iraq, Syria in the name of Jihad. Don’t turn Kashmir to one. India is the next superpower of the world and the future of Kashmiris will be in safe prosperous hands. Dear Kashmiris, you have a choice in between two ITs – Information Technology and International Terrorism. Say no to International Terrorism and these fanatic Jihadi blog writers. If any one has the claimvon Kashmir it is the Kashmiri Pandits , who are refugee in their own land! No Islamist can any thing in Kashmir, they are from Arab they must confine there.